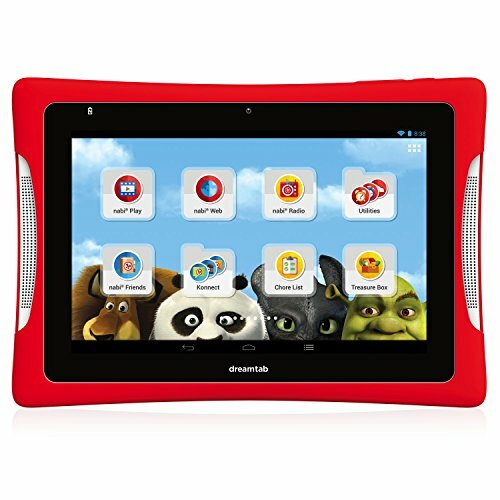 Fuhu’s goals to create a really useful tablet for kids that will make parents happy with a nice low price tag has come to fruition, when the new Fuhu Dream Tab was announced this week at the CES 2014 show in Las Vegas. In a team effort with DreamWorks Animation, the DreamTab will surely bring hours of fun, education and entertainment to kids with songs, a new animation program, learning tools, special apps from the DreamWorks library and the most popular applications, such as,†Angry Birds as well as Cartoon Network games. “By teaming with DreamWorks to create a device that will have original content — original content that is automatically and frequently updated — we are not following consumers, we are getting ahead of them,” said Jim Mitchell, Fuhu’s chief executive. Another highlighted feature that every parent loves is: nabi Time Controls that let you to set time limits for your kids daily consumed. Instead of letting your kids eyes on the screen for many hours, you can just set 30 mins as a “fun time” window. Fuhu hopes to be compete with iPad by offering parents a much more affordable tablet for their kids, but also one that does not skimp of usability and features. By teaming with DreamWorks and bringing the countless characteristics that kids love they just might succeed. Powered by the Android operating system, this tablet features bright colors, which will be very appealing to kids, versus the more mono chrome and black varieties offered to adults. There will be 8″ and 12″ models and these tablets will run on the latest KitKat Android operating system. This is the first 8″ inch kids tablet with DreamWorks Premium Content. I think the screen size is superb and very enjoyable for the new generation. The use of 100 DreamWorks characters as an alarm clock, or for exercise routines with the Shrek donkey. While the Dream Tab will feature traditional apps, DreamWorks will also have the opportunity to engage young children with a TV Channel that will push out a new character moment every day of the year. The tablet is sure to be loaded with tons of DreamWorks related activities and programs. Many more DreamWorks related content is expected. Special Discount that other Kids Tablet can’t beat! There will also be a bright red wireless printer that can connect to the tablet. This is wonderful because kids love to have their own stuff, after all who wants to share tech toys with their parents? And, the color will be a perfect fit for both young boys and girls. Another related product announced is the Nabi Karaoke machine that is compatible with the tablet and includes a big red microphone and speakers. Prices are yet to be announced, probably around $299. Release date is expected in the first quarter. The stock is limited. It’s less than $200 and get it before Out of Stock! Fuhu’s Super-Sized Dream Tab at CES 2014! I love the very interactive experience the DreamTab provides as shown in the above video with the desktop arrangement and touch screen display. This is much better than kids just sitting and staring at a computer screen. Amazing how nice they look sitting on the desk, really large screens and super vivid high def display that will surely delight and engage even the youngest of kids. The colors are amazing on the game, with such life like characters! Last year, Fuhu’s $199 Nabi struck a chord with parents: More than 2 million units sold. In a market well-saturated with kid-targeted tablets, DreamWorks wanted to make sure that its own would hit the ball out of the park. So, it teamed up with a company that knows how to build kids’ tablets better than most:Fuhu. The Fuhu concept was to create an in-expensive tablet computer parents would be happy to pass on to their kids and keep them happy, so that their beloved iPad would remain in their own hands. “Kung Fu Panda” and “Madagascar” movies has partnered with El Segundo-based Fuhu Inc to create DreamTab, billed as a state-of-the-the art tablet designed for kids. DreamTab will be unveiled at the CES technology conference in Las Vegas next week and be sold in stores this spring for less than $300. Fuhu, the company behind the popular Nabi tablet for kids, introduces its new Dreamtab, a new product tablet with content provided by animation studio DreamWorks, at the Consumer Electronics Show. Dreamtab from Nabi. Fuhu has been very creative to create an interesting kids tablet and partner up with Dreamworks to bring their signature titles to kids tablet. “Kung Fu Panda” and “Madagascar” movies are popular “must-have” on your kids tablet. It’s awesome that they come with a brand new Dreamtab. I’m sure the “branded” Dreamworks tablet experience will stand out in the market.